Below, Deb asks the question “What if…nothing is wrong throughout your wedding planning? What if every glitch is as it should be?” I completely love this train of thought. By shifting how we think and react to situations, we essentially change our lives for the better. Consider the possibility… that there is nothing wrong… that all is as it should be…that every seeming “glitch” in your wedding preparations is leading you to something that will work even better! What if you trust this…just for today…and, as a Valentine surprise for your fiancée you are able to enjoy Valentine’s Day as your most relaxed, peaceful, and loving self? 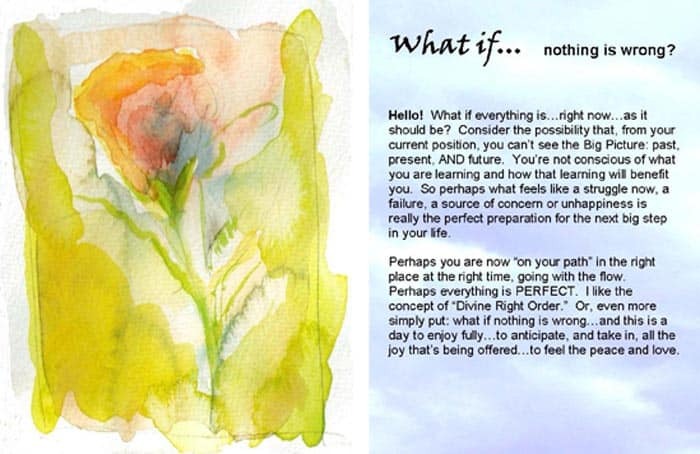 What if…from here on out…through the wedding prep, the actual wedding day, and on into your married life… you adopt this thought: that all struggle/ all difficulty is really opportunity for something better to emerge…or for learning and growth to take place? What if… you agree to see life’s challenges as bringing you and your future spouse closer? What an amazing relationship you will have! Plus, all the time you would have been investing in non-productive, generic worry can now be harnessed to move you forward… together… into a most loving and enriching relationship! This is a better thought process to prepare for stressful situations then just getting infuriated about everything. Yes, all the energy wasted on something you can’t change could be used productively on what you *can* change.